Most of us cook with aluminum foil, however, because of dangers associated with leaching from aluminum foil, that may no longer be a safe option. Research into the dangers of cooking with aluminum foil has found that some of the toxic metal can contaminate food. This is especially true when foil is used to cook or heat spicy and acidic food. Increased levels of aluminum in the body have been linked to osteoporosis, and Alzheimer’s disease. Aluminum is used in many cooking processes, not just wrapping fish or meat in foil and putting in the oven or on the barbecue. Many cheap pots and pans are made using aluminum. Also, according to the Agency for Toxic Substances and Disease Registry (ATSDR), aluminum is used in the production of processed foods which are stored in aluminum containers that are then heated in an oven.1 Aluminum is also used in producing certain medications, antacids, some cosmetics, and deodorants. The International Journal of Alzheimer’s Disease looked at the aluminum-Alzheimer link. They found that people with Alzheimer’s disease have elevated levels of aluminum in brain cells. 3. How Safe Is Your Nonstick Cookware? Biol Trace Elem Res. 2014 Jan;157(1):14-23. Yeah like back in the 1990’s people tried to link cooking in aluminum pots with what became known as Alzheimer’s. That was debunked. It’s your choice Steve. Do what you believe is right for you. Do anodized aluminum pots & pans leach? From what I’ve read in whfoods website anodized aluminum is less reactive than non-anodized aluminum and will leach less aluminum as a result, provided that the surface has not been damaged. Dr Weil also say that well-made anodized aluminum cookware that doesn’t have any scratches is probably okay. In food service applications we often spray the top of the food with spray oil, put on a layer or two of plastic wrap and then final cover with the aluminum foil. Prevents foil contact with the food, protects the plastic from burning and allows for proper cooking of the food. Of course, those predisposed to petroleum sensitivities would be better served by using glass containers. 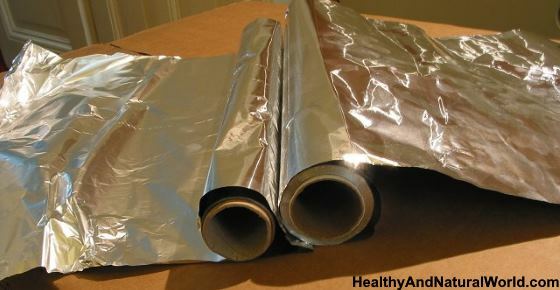 You can use aluminum foil to store cold food (like cheese) for short periods of time, or you can simply wrap it in a waxed paper. So ditch the foil but we can still slather aluminum on our underarms, or get it in vaccines. I’m glad people are starting to wake up, but it may be too little, too late. I am attempting to rid my life of aluminum products. I primarily use aluminum foil when baking for easier clean up. Would silicon baking sheets work for this? Are there any concerns when using those? The use of silicone in cookware is relatively new, so there hasn’t been much research regarding its safety for use with food, the potential for leaching at high temperatures or chemical sensitivities in lower-quality silicone. Many people prefer to use silicone at low temperatures and try to avoid using it in high temperatures (although the FDA approves it to be used up to almost 450°F). You also need to make sure it is high quality and doesn’t contain fillers or dangerous additives. Dr. Andrew Weil says that no safety problems have been reported so far, but if you’re concerned, stick to silicone kitchen tools (such as spatulas) and avoid bake-ware. “The ingested amounts of aluminum are relatively small!” “They recommend that “avoidance of aluminum exposure, when practical, seems prudent.” What they forgot to mention, was about the nano particles of aluminium that we are all breathing in, because of the aerosol spraying of chemtrails that is happening on a daily basis. A nice concoction of aluminium, barium, and strontium. Until they stop this practice, there is “no way” to avoid exposure! A long time ago (the 80’s) I learned about aluminum foil and that the dull side is where the aluminum is coated. My lasagna that I made and stored with aluminum foil shiny side facing up, dull side down. The aluminum that touched the tomato sauce came off on the food. I have tried relentlessly to educate people, but they won’t listen to make I am telling them. Perhaps this post will educate them!